Amazing, fantastic, incredible, is right! What a life! To grow up and do what you love, but always saw as just a hobby. Creating something for others to love, and for these things to be still loved so many years later. Perfect title for a memoir about such a fascinating man and his life. Plus, true to form, the comic layout of the story is so much fun to read. You find yourself comparing the likeness when you come across celebrities such as George Clooney or Angelina Jolie. 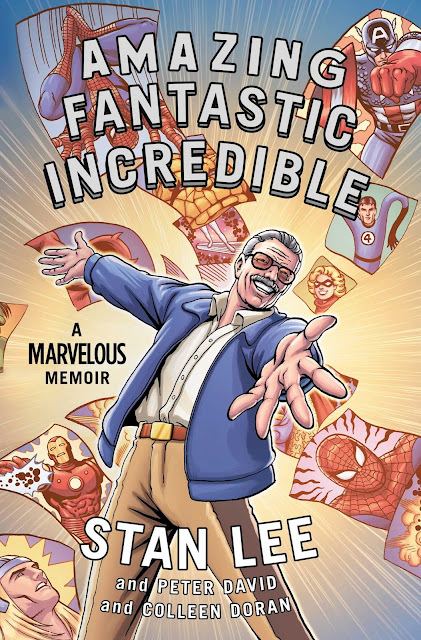 Memoir fans, comic book fans, well, frankly, everyone will get a kick out of this one for one reason or another. It can be read pretty quick in one sitting too. I've been waiting to see your comments since you had it as the Friday 56 recently! So excited it was good, I think it would make a great gift for my son, and something we'd like too! Oh I think my son would love this book! He is into comic book heroes, but he is also a reluctant reader so this might appeal to him.